Is anyone else as repulsed by this drawing as I am? 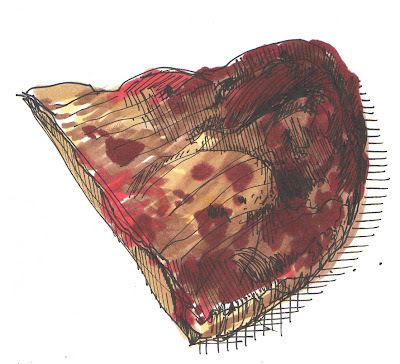 Actually, at first I was just disgusted by the subject matter...leftover frozen pizza (I'm not sure if it is discernable or not), then by the drawing itself...and later by the subject matter again. I actually drew this a few days ago and hated it...HATED IT. But the more I flipped past it in my sketchbook the more I decided that it posesses a quality that I kinda like. Funny how things work like that. Okay, since I've found myself drawing pizza a time or two, I'm going to say this is just a fantastic subject to study and draw. How could you think otherwise? And I think it's a wonderful drawing too. Seriously on that last part. I am with Karen here. Tried before, failed miserably -- and when i see your drawing, the hues of red, the angle -- it makes me think *darn*. Karen, France- You're certainly right, this was "no pizza cake." I'm sorry....I couldn't resist.